At one point in the breed’s history, the Cocker Spaniel and the Field Spaniel were the same breed only separated by weight. 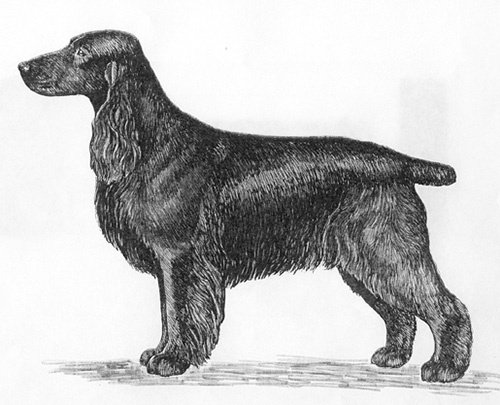 The Cocker Spaniel was shown under 25 pounds, and the Field Spaniel was shown over 25 pounds. The breed then took a different path, which nearly led to its destruction. The breed became a short-legged, heavy-boned dog, only 12 inches high and weighing as much as 40 pounds. In 1948, the Field Spaniel Society was reformed in Britain and breeders started eliminating the exaggerations in the breed. The breed now is a more balanced and a good working dog. During these intervening years, the English Cocker gained so many friends it is unlikely that the Field Spaniel will ever catch up. 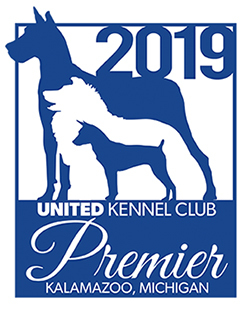 The Field Spaniel was recognized by the United Kennel Club in 1984. It is a well-balanced, noble, sporting dog about 18 inches at the shoulders and weighing from 35 to 50 pounds. In proportion it is somewhat longer in body (measured from the prosternum to the buttocks) than it is tall. It is black, liver, golden liver, roan or mahogany in color, with a flat or slightly wavy coat. Unusually docile, good natured. A good working dog. The head conveys the impression of high breeding, and must be in proportion with the size of the body. Slightly wider at the back than at the brow, and lightly rounded on top with a well defined occiput. Clean and flat on the sides. Stop is moderate but nicely defined by the brows. Long and lean with a straight nasal bone. In profile top line of muzzle is slightly divergent from top line of skull, and bottom line curves gradually from nose to throat. Muzzle is never snipey or squarely cut. Lean beneath the eyes. Almond shaped, not too full, but not small, receding or overhung. Color dark hazel, brown or nearly black, depending on the color of the dog. Grave in expression, suggesting docility and intelligence, and showing no haw. Moderately long and wide, set low and sufficiently clad with nice setter like feathers. They should fall in graceful folds, the lower parts curling inwards and backwards. Large and fleshy with open nostrils. Long, strong and muscular, so as to enable the dog to retrieve his game without undue fatigue. The shoulders should be long and sloping and well set back. The forelegs should be of fairly good length, with straight, clean, flat bone and nicely feathered. Dewclaws may be removed. The chest is deep, but not too wide, with well developed forechest. Back is strong and level. Ribcage is long and moderately well sprung. Loin is short, strong and deep with little or no tuck-up. Croup is short and gently sloping. Strong and muscular, with broad thighs. Stifles should be moderately bent and not turned either in or out. Rear pasterns short with bone that matches front legs. Dewclaws should be removed. Not too small, round with short, soft hair between the toes, and good strong pads. Docked or natural. Set on and carried low, if possible below the level of the back, in a straight line or with a slight downward inclination, never elevated above the back. In action, always kept low. If docked, to mature at about 4 to 6 inches in length. Single, flat or slightly wavy. Sufficiently dense to resist the weather and not too short. Silky in texture, glossy and refined. Never curly, wooly or wiry. On chest, under belly and behind the legs, there should be abundant, but not excessive, feather. Clean below the hock joint. Black, liver, golden liver or roan, any permitted to have tri-color markings (tan over the eyes, on the cheeks, feet and pasterns). Bi-color dogs must have roaning or ticking, not clear white. Solid color dogs may have white or roan on the chest. Height about 18 inches at the withers, and weight from 35 to 50 pounds. The gait is characterized by drive and the appearance of power rather than speed, indicative of the breed’s use as a hunter in dense cover and upland terrain. The stride is long and low. The head is carried proudly while in motion. The topline remains much the same whether in motion or standing. The legs move in a straight line with width between the front and rear legs that is appropriate to build and gait.